Good Evening TmoNews readers! 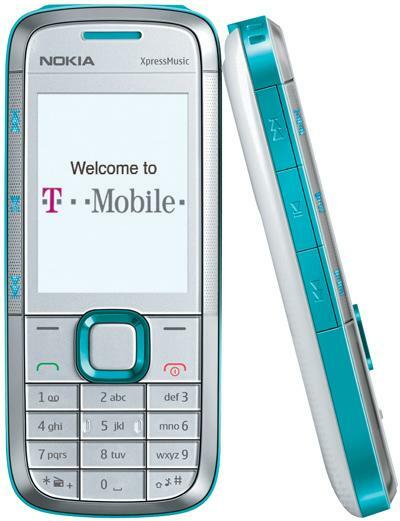 Today Nokia announced the Nokia 5130 XpressMusic – available exclusively from T-Mobile, starting today. This music-centric handset is equipped with a 3.5 mm headphone jack, stereo Bluetooth, FM radio, 2 megapixel camera with video capture, WAP browser, instant messaging and e-mail and the Series 40 operating system. The Nokia 5130 comes in two flavors, Black Red and Pearl White Aqua. The Nokia 5130 XpressMusic is available today at select T-Mobile retail stores and online for $29.99 after $20 mail-in rebate and two-year contract. So if your on a tight budget this handset is a nice affordable option. Sure, the price is right. But this phone is almost a year old. When is Tmobile going to get some high-end Nokia devices? And if you’re talking about the N900. I’ve yet to see any hard proof that it’s coming to Tmo. And NO… the FCC approval doesn’t count. It only states that it is approved for the 1700mhz 3G data band witch is the same as Tmo. Too many people read that and assumed since it was approved for the 1700 band it must be going to Tmo.